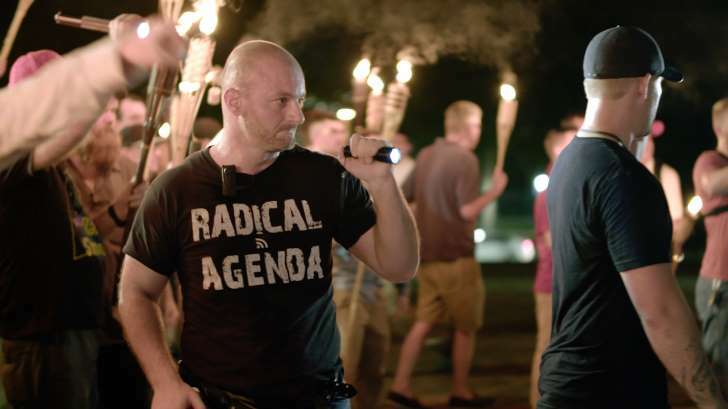 The University of Virginia Police Department on Tuesday said it has obtained warrants against Christopher Cantwell, one of the people at a white nationalist/pro-Confederacy rally that turned deadly in Charlottesville last week. The warrants against Cantwell are for two counts of illegal use of tear gas and one count of “malicious bodily injury by means of any caustic substance or agent,” stemming from events on the campus on the evening of Aug. 11, police said, as they urged Cantwell to turn himself in. Police did not release more details, saying the warrants are part of an ongoing investigation. All the counts in the warrants are felonies, the department said. Cantwell has been called a leader of right-wing rally and was featured in a Vice News documentary. A resident of Keene, New Hampshire, according to police, Cantwell was later seen in a video that went viral in which he said he believed a warrant was issued for his arrest, and that he was scared about being killed if he turned himself in. “I presume this is the accusation because I certainly wasn’t running around pepper spraying innocent people, like the communists who attacked us did,” Cantwell said in the email.